In 1851, Léon Foucault, A French physicist, demonstrated the rotation of the Earth on its axis by his new invented Foucault pendulum, or Foucault's pendulum, named after him, by suspending a 67-metre wire from the dome of the Panthéon in Paris. The Foucault pendulum is a tall pendulum free to oscillate in any vertical plane and capable of running for many hours. It is relatively a large mass suspended from a long wire mounted so that its perpendicular plane of swing is not confined to a particular direction and, in fact, rotates in relation to the Earth's surface. Foucault first pendulums of this type, consisted of a 28-kilogram (62-pound) iron ball suspended from the dome of the Panthéon in Paris by a steel wire 67 m (220 feet) long and kept in motion by a mechanism. The rotation of the plane of swing of Foucault's pendulum was the first laboratory demonstration of the Earth's spin on its axis. While any Foucault pendulum swings back and forth in a plane, the Earth rotates beneath it, so that relative motion exists between them. At the North Pole, latitude 90° north, the relative motion as viewed from the plane of the pendulum's suspension is a counterclockwise rotation of the Earth once every 24 hours; whereas the plane of the pendulum as viewed from the Earth looking upward rotates in a clockwise direction once a day. A Foucault pendulum always rotates clockwise in the Northern Hemisphere with a rate that becomes slower as the Equator is approached. Foucault's original pendulums at Paris rotated clockwise at a rate of more than 11° per hour, or with a period of about 32 hours per complete rotation. The rate of rotation depends on the latitude. At the Equator, 0° latitude, a Foucault pendulum does not rotate. In the Southern Hemisphere, rotation is counterclockwise. The rate of rotation of a Foucault pendulum can be stated mathematically as equal to the rate of rotation of the Earth times the sine of the number of degrees of latitude. Because the Earth rotates once a day, or 360° every 24 hours, its rate of rotation may be expressed as 15° per hour, which corresponds to the rate of rotation of a Foucault pendulum at the North or South Pole. 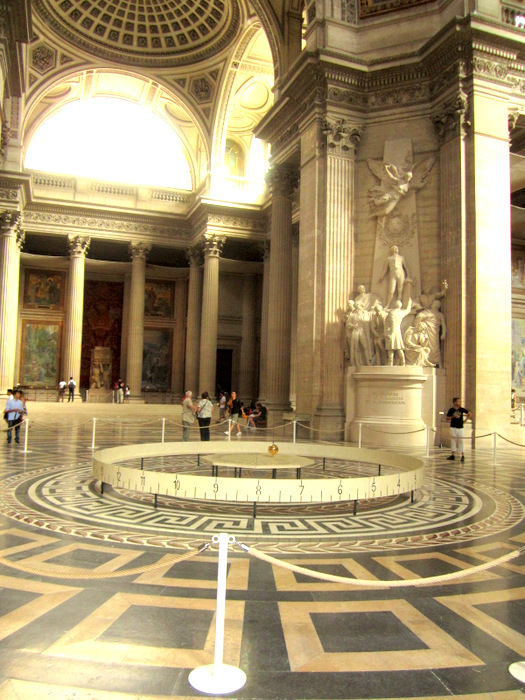 At latitude 30° north, for example, at Cairo or New Orleans, a Foucault pendulum would rotate at the rate of 7.5° per hour, for the sine of 30° is equal to one-half. The rate of rotation of a Foucault pendulum at any given point is, in fact, numerically equal to the component of the Earth's rate of rotation perpendicular to the Earth's surface at that point. The following nice experiment was suggested by J. W. Dooley, Millersville University Physics Department. The suggested Foucault’s pendulum is mounted on a 4 foot ladder, as is shown at the above picture. 1 Replacing the energy lost (mostly due to wind resistance) so that the pendulum continues to swing without "dying down." If this is not done, for a pendulum of ordinary size, the swing comes to a stop before the earth has had time to rotate significantly, and the evidence for the rotation is lost. 2 Ensuring that the pendulum will swing with equal ease in all directions. Without special care a pendulum has a preferred direction of swing. When its plane of oscillation arrives at a preferred direction, the pendulum tends to stay there, and evidence for the earth's rotation is lost.